Calgary Rants: Concrete Equities.."No Money Now....or Later?" I took a look at their website, which is no longer functioning. There is a link to the receivers website, which has all of the public documents listed in PDF format. Interesting material.....if you are into that sort of thing! I am really curious to see how this saga will unfold and even more interested to see if there will be any criminal investigation into the matter? I do not feel sorry for the CBC however! I believe that the should have done their homework on this company before having them as their main sponsor. 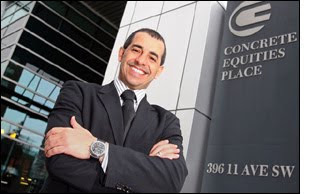 Having Concrete Equities as the main sponsor of a prime time CBC show added unfounded credibility to this investment group, and I am sure that most people figured they were legit, based on the CBC's "'endorsement". Check out the CBC page here....(and the comments below...) how embarrassing! I'll be keeping an eye on this story with great interest! If anyone has any good links/stories, let me know. For the better part of the past 2 or 3 yrs I've shaken my head when I saw or heard firms like this advertising in the Calgary market. C'mon people, if it walks like a duck and smells like a duck, most likely it is a duck. If you look up this Ryan Jenkins thats on the run, on Linkedin.com, you will find he was affiliated with this company. Kind of a funny situation...criminals seem to hang out together. He toughted that he was a investment banker on Megan wants a millionaire. I see now where he got his couple of million to get on the show. I would think that a company hiring a Sales Rep (Jenkins) with a documented history of violence againt women(including police records in both the U.S. and Canada)may not hold the highest level of ethics or standards. The second Anonymous is quite right. Actually they hired a VP who was under a lifetime ban from the Real Estate Association of Alberta. He is now accused of embezzling funds for a Mexican Condo. The first time I heard a radio ad for Concrete Equities and many times since, I was struck by the sheer audacity of the message; "Some smart people invested with us and made windfall profits. If you invest with us... You do the math." What always came to mind was the disclaimer American investment companies are required to state: "Past performance is no guarantee of future success." Boy was that a truism here. Alberta Venture (full disclosure, I'm the web editor there) has an article up detailing the crumbling of Concrete Equities and it too is one of our most popular articles. I by no means cordon these actions in any way. But, I have made money with smaller private investments and you need to do your homework, ask the hard questions. What I have always practice is look at the board and management team, who are they and how do they add value to investment? Also, why is no one pissed at the banking industry for killing investments like my kids RESP, Im am! We lost $50,000 and it looks to not be coming back. Or have we just come to expect this from the bank investments. I just watched as a client of mine, who was essentially in the same line of business as Concrete Equities spirialed toward a similar fate. I think these sydication type of investments work fine...just as long as the market is going up. When it stops, people sue each other. They should have primed their clients into realizing that there is always a downside to every upside. If they had - I bet nobody would flinch when their returns took a little bit of a slide for a period.